Is there such a thing as a ‘magic’ question when interviewing for a job, or even when you are hiring someone to join your team? What if you could ask or answer this one question to land any job, or ensure you are hiring the very best candidate? Yes, that question is “Why do you do what you do?”…. your answer defines you! Consider this: Apple has access to exactly the same information as everyone else. There’s no secret knowledge they have that other computer companies don’t. But they’re the only computer company that has people lining up for days for their new products – but it’s not because they’re better. It turns out there’s one crucial question you need to ask yourself to put yourself in the same field as the very best companies in the world, and instantly stand out in a field of candidates with similar skills and experience all vying for the same job. In a TED talk that’s clocked up over 6 million views, author and motivational speaker Simon Sinek reveals what it is. 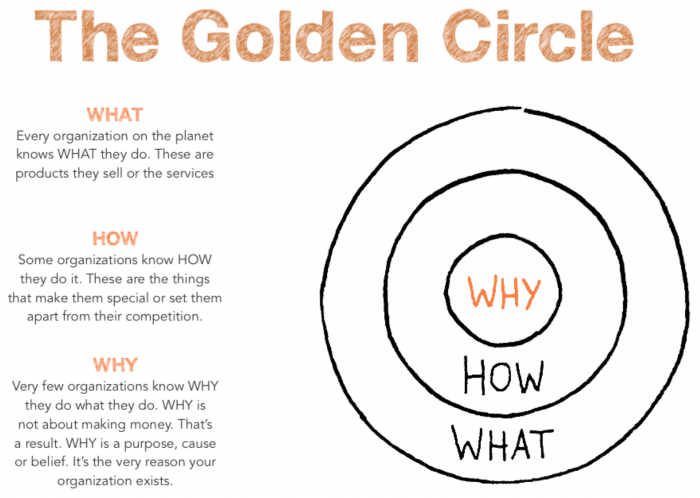 Sinek identifies the ‘Golden Circle’ of what, how and why. While Sinek uses organisations as an example, it’s also true of individuals. Most people can identify what and how they do things, he says, but the why is more challenging to answer – but also the most important. The ‘what’ and ‘how’ is the same as all the other candidates, but your ‘why’ sets you apart from countless other candidates and demonstrates your passion to hiring managers. Read on to see why job seekers who know their ‘why’ are more appealing than those who don’t. Imagine the following conversation playing out a dinner party, networking event or job interview. I use a range of tools to numbers and balance the books. Your why is the fundamental reason to pursue one career path over another. It’s your specific passion for your work, your purpose and beliefs. It’s your underlying motivation, beyond financial gain. Thinking back to the example of Apple, their ‘why’ according to Sinek is challenging the status quo, which they achieve through beautifully designed, easy to use computers, and by communicating this mission, they get people to wholeheartedly buy into their products. Your why is the ultimate thing you need to communicate to a hiring manager – so first you need to discover it. Think about what gives you satisfaction, what makes you happy in your work and what gets you out of bed in the morning. I believe that sound financial guidance is empowering for individuals and organisations. “People don’t buy what you do. They buy why you do it,” says Sinek. Only you can know why you chose your career path, strive to achieve great results, and aim to excel in your field. People tend to accomplish their best work when they are passionate, engaged, and rewarded by their career, so it really pays to spend time figuring out your purpose. Your why gives you purpose and fulfillment. Without it, it is that much harder to achieve professional dreams and build a career that you’re invested in. This is not only great for job satisfaction, but it also helps hiring managers choose a team that will stay engaged longer and produce better work – so showing them your motivational drivers will signal in an interview that you’re a strong potential candidate. When you understand your why, it becomes the guiding principle for your career choices, both while job searching and in a role. It reflects your values, attracts the right kinds of opportunities, and determines the ‘how’ and ‘what’ of your behaviour. Importantly, gaining clarity on your motivations means you can then weave them into your personal brand – across your CV, LinkedIn, and most importantly, in job interviews. Once you know your why, you can more easily communicate this in person to the hiring manager. The person on the other side of the table will recognise the drive and authenticity behind your words, which will really help you stand out from the pack.